Matthew: So, generally speaking, I enjoy conspiracy-themed episodes of Trek. If the whole world seems wrong (e.g. "Remember Me"), or everyone interacts with one particular character in an off way (e.g. "Whispers"), it makes for a nice, unsettling atmosphere. The question is what you do with it. This episode uses it as a backdrop for the introduction of Section 31, a covert intelligence/black ops unit in Starfleet. I'll get that that idea below, here I'll just say the execution of the plot is pretty good, with a few caveats. I liked all the continuity shout-outs that Sloan made to Bashir's past acts, and to his special status. I would also like to cite this episode as evidence for my previously advanced thesis that Bashir would be a much better candidate for intelligence recruitment than O'Brien. That said, I do have a somewhat difficult time believing that a holodeck simulation could be convincing enough to last from the first act of the episode until the final blunder. How could they have gotten Sisko's responses as counsel down so well? All the details of friendships, speech patterns, station life? I think the story might have benefited from a few more clues that something was awry, especially since such clues tend to lead to fun scenes like the ones we enjoyed in "Future Imperfect" and "Whispers." Kevin: The episode definitely did a good job of building the tension and setting a mood. The sudden change of plans, being stuck in his quarters and the lack of food really set the stage well. What I found most effective from a character standpoint was the easy way Sloan twisted all the details of Bashir's life. The episode it put me in mind of was "The Drumhead" and the way it seems so easy to turn coincidence and innocent associations into a threat. There was something Kafkaesque about the way Sloan was drilling him with questions and twisting his words. Matthew: So... Section 31. I don't hate the idea. Yes, it's a pretty big retcon, but if in fact they had been super secret, I can stomach that we wouldn't have heard of them until now. I do think however they could have stood to drop a few more continuity nods, things that they had a hand in (Star Trek VI springs to mind as fertile ground). Now, for a super secret organization, they don't do a terribly good job of keeping things on the down low - this episode ends with the whole crew discussing them at length. The basic ethical question of the episode is a fine one, and is certainly one that remains current - what price security? They don't really show the bad stuff Section 31 is supposed to have done, though, which blunts the message. Yes, they abduct Bashir without due process. But what sorts of unseemly things have they done to "save all those lives?" Kevin: I would have liked some more exploration of Section 31's actions too. They're only going to touch on some of these questions briefly over the course of 31's existence, but I think an interesting question, both in the show and in reality is not just how far should we go to feel safe, but what that says about us as a people. Federation citizens sleep well in the belief that they are above organizations like the Obsidian Order and the Tal Shiar and that their society is better as a result. The truth would meaningfully impact their self image. By the same token, I don't think I'm going out on a limb to suggest that a vital part of American self-identity is the believe that we do things in a better way, that we embody something that the world should view as example. So finding out we are in fact just as capable of an ends-justify-the-means actions means we aren't quite who we think we are, and that more than the direct question of do the ends justify the means would have been a super fun and super Star Trek question to explore. Matthew: Overall, there is a nice, crisp sense of pacing, and much of the dialogue is good. I think the writers wrote to the strengths of actors, which is always big. I think there was the chance for some ambiguity, actually making us wonder whether Bashir is a mole. Nonetheless, the story at least had Bashir wondering, which is an interesting situation for his character. I liked seeing him try to withstand the withering case being made by Sloan and Weyoun, and any chance the writing gives us to see Weyoun, works for me. Kevin: Before the reveal of the holodeck, that scene with Weyoun gave me chills. It reminded me of "The Manchurian Candidate" and TNG's "The Mind's Eye." I almost wish he had been a sleeper agent. That would have been a fun twist. Matthew: When yelling, Siddig doesn't do it for me. "Grrar, I'm done playing your games, Sloan! Graar." Yawn. When calm, though, I enjoy his performance quite a bit. I think he especially played fatigue quite well. Maybe it's because he has a new kid, maybe it's because he's good at yawning. It works in the episode. As far as the rest of the main cast, only Avery Brooks really got anything juicy. I felt he was playing it pretty straight, which disappointed me once the big reveal was made (i.e. that it was all a simulation). I would have preferred to see a more mechanistic quality for the main cast outside of Bashir. Kevin: I agree on both counts on his yelling and his yawning. He really nailed that tense fuzziness that accompanies lack of sleep. Matthew: William Sadler is absolutely superb as Sloan. I kind of want to just watch him in lots of episodes. I love when he plays nice with Bashir, you can just see the layer of malice hidden slightly behind his friendly veneer. He also brings a seriousness to the role that has us believing that he thinks he is in the right, and maybe goes some way towards convincing us, too. That's so much more interesting than outright villainy. Kevin: Apparently the producers initially approached Martin Sheen for the part, and he turned them down. I love President Bartlett, but I am glad he didn't take this one. I think his celebrity in such a central role might have broken the fourth wall a little and, like you said, Sadler is awesome. He played Death in the second Bill and Ted movie, just FYI. But, yeah, he had a great quiet menace to him that was really fun to watch. 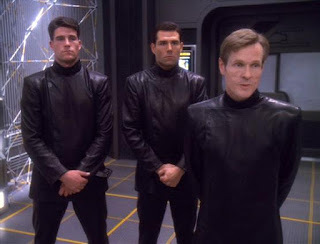 Matthew: Why would a super secret organization give their operatives any uniform at all, especially one so sinister, and so out of keeping with the rest of Starfleet garb? The black leather was just over the top. Do they keep these togs in their closet, ready for super secret Section 31 business? Do they want to look sinister? It's just one of those production choices that makes you question too much. Kevin: We made that complaint about the conspiracy in "Into Darkness" and we must make it here as well. No uniforms for your secret bad guys, people. Matthew: This was a Dorn-directed episode, and I think he acquitted himself admirably. There were some nice camera moves and odd-angled shots, especially during the ramp up of the tension and mystery. I also liked that we got to see the infirmary, and Bashir's quarters, two sets we don't see very often of late. I especially like seeing the Voyager holodeck set, since of course they should not be on the station holosuite if Bashir has been abducted and held on a Starfleet vessel. Kevin: Particularly in the scenes of Bashir waiting in his quarters, there were some fun angles and a sense of claustrophobia that really helped set up the field. Even that intro scene in Ops. Sisko almost never has someone standing with him giving important information from the doors to his office and I think the camera was angled a little more steeply than normal. It just felt like something was wrong. I also loved the use of the Voyager holodeck set. It's the small touch that gives the universe continuity. In fact, I think I liked it more than I would have had they used a TNG-style holodeck since I think the black room would have been too much. The Voyager style with its brighter lighting feels more ordinary, and thus heightens the tension of what is going on in it. Matthew: I think a 3 or a 4 are both fair ratings, given how much an viewer liked or disliked the theme. This episode is not close to perfection, but I do think it is above average in terms of entertainment value. So I will say it squeaks into a 4. Kevin: I agree on the 4 as well. They really needed to either show us Bashir was actually brainwashed, or show us the teeth of Section 31's threats to elevate this. Though, I agree it is an above average hour of entertainment, so I agree with the 4 for a total of 8. I'm a bit late in commenting on this, but I just wanted to note how spectacular William Sadler was in this role. I agree that I could have watched him in many more episodes of Star Trek, and it's almost a shame that he was only in a total of three episodes. He's been a bit of a prolific character actor, and every time I see him in something, I think he's just as great as he was in DS9. Ok, I'm done fangirling now.